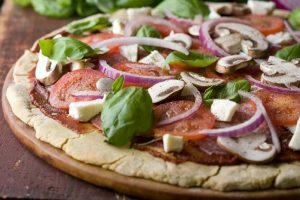 How would you like to be able to make your own pizza sauce that can also double as a sauce for most of your favorite pasta dishes? 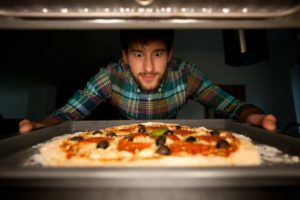 If you answered, “yes,” then you should keep reading, because we have an awesome pizza sauce recipe that we think you are going to absolutely die for. This is pretty close to being an authentic Italian pizza sauce recipe, except for the fact that it didn’t come from an Italian. 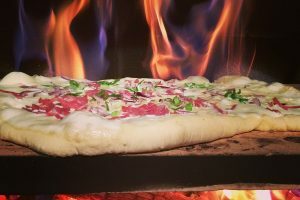 Yes, it is a bit of a copycat, but we have added a few of our own secret ingredients that make this one of the most delicious pizza sauces you will ever taste. One thing we are doing with our sauce recipe that isn’t completely authentic is leaving out the fresh ingredients. This is a recipe that you can make in a hurry, and you may not always have fresh ingredients available to use. But, it is pretty easy to get a few cans of stewed tomatoes, which is what we are using in our almost-authentic Italian pizza sauce recipe. So, are you getting curious as to how to make this super-delicious pizza sauce? We thought so. 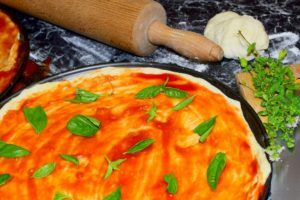 Keep reading to learn just how easy it is, and how few ingredients you need to make delicious pizza sauce that will rival anything you have ever had from any pizzeria. 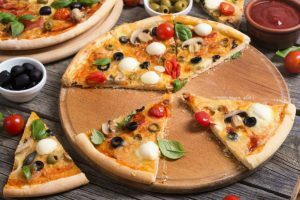 Unless you are an Italian, you can’t legitimately say that anything you cook is a true Italian dish, including pizza sauce. That’s why we said our sauce recipe is the very next best thing to being an authentic Italian pizza sauce recipe. 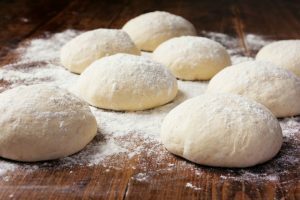 You can use all of the same ingredients that would be used in an authentic recipe, but it probably still isn’t going to taste the same, just because it will not be made with that certain cooking style that can only come from a real Italian kitchen. But, we dare you to try this sauce and say that it isn’t just as good as anything you have ever had from any real Italian restaurant. You don’t need to run out and buy a whole lot of strange ingredients in order to make a delicious and authentic Italian pizza sauce. The main ingredient in our recipe is tomatoes, obviously, and all you need are two large cans of them. They can be whole, sliced, or diced, it doesn’t matter, because you are going to puree everything before putting it on your pizza. Okay, so you know you need tomatoes. You will also need to get a large can of crushed tomatoes, and one large onion. If absolutely necessary, you can use onion powder, but the real thing is always better if you want a truly authentic taste. Make sure that you also have some fresh garlic on hand. Again, the powder will do in a pinch, but it’s just not the same. Don’t forget about some green pepper as well, which definitely should be fresh. Last but not least, you will need mushrooms. Canned are okay, but fresh taste much better, and it’s what any discerning Italian would use for their own pizza sauce. Now you need to choose your seasonings. These can be dried, but if you have some fresh herbs, that is even better. You will need to use black pepper, Italian seasoning, oregano, and basil. Don’t forget to grab a bit of red wine (some for the sauce, and some for you to enjoy while you are making the sauce). 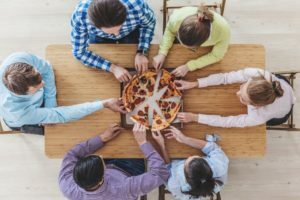 Of course, you can also add other seasonings or remove any of the ones we have listed, but this is going to change the flavor, and you may not get that Italian flavor that you really want. Okay, if you were making a pasta dish, you would probably want to take your time to make a perfect pasta sauce. You don’t have to worry about this when making pizza sauce. You are going to get that authentic Italian flavor, without having to spend hours in the kitchen or digging out your slow cooker for an all-day sauce. The first thing you need to do is put all of the ingredients in your blender, and puree the stewed tomatoes with the crushed tomatoes until you have a smooth sauce (don’t worry, we will add some chunks later to give your pizza more texture). Transfer this mixture to a pot, and add the seasonings. Mince the onion and garlic, and finely chop up the green pepper. Add the vegetables to the sauce, and cook over low heat for 15 to 20 minutes. Okay, so you have the basic idea. 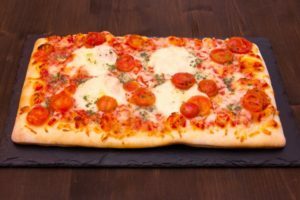 Now, let’s get into the real nitty gritty and take a look at our recipe for delicious, Italian pizza sauce (which you can also use with pasta if you want to make something up in a hurry). Combine the stewed and crushed tomatoes, and puree in the blender. Stir in seasonings, red wine, crushed garlic, bouillon powder, and sugar, and transfer to a medium-size pot. Heat on low for about 15 minutes, or until all of the flavors have blended together somewhat. Now you can add your green pepper and onion, which is going to give the pizza sauce a bit more texture. Finally, drain the diced tomatoes, and add these to the sauce as well for even more texture. 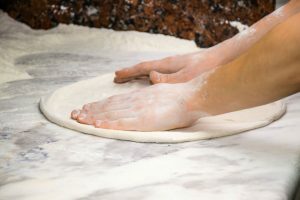 Take the pot off the stove, and spread the sauce onto your favorite pizza dough (you can also make your own pizza dough, and it will be better than anything you get from any grocery store). 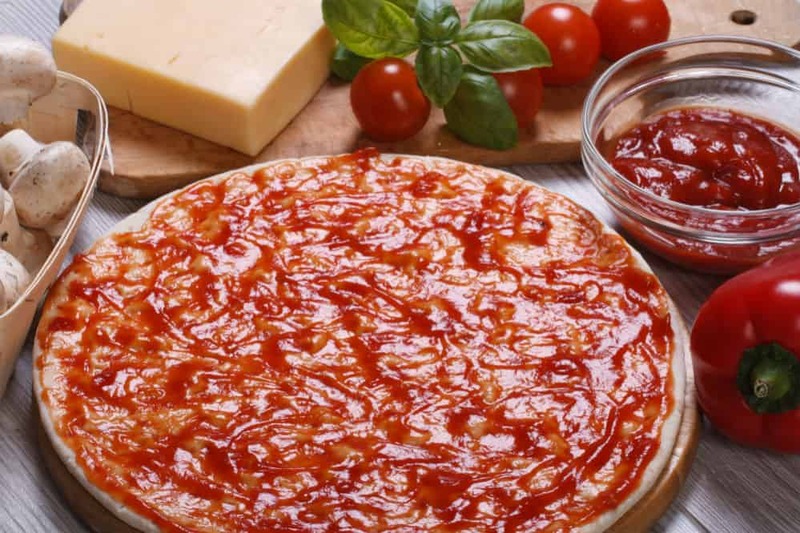 « Best Store-Bought Pizza Sauce	» Pizza Sauce Vs Pasta Sauce: What’s The Difference?